Tomorrow starts a new month: March. And, for the past several years, March’s have been quite active, cold, and wet. Last March is a good example of one of the coldest March’s we have had in the past 10 years with temperatures running nearly 3 degrees below normal, conversley March 2005 was unseasonably mild with temperatures running a good 3 degrees above normal. What does March 2009 have in store? Well, many forecasters are predicting a colder and wetter than normal March, and by looking at the short and long term models, those forecasts may not be far off. The title of this blog post is “Dèjá Vu” mainly because we could go through a very similar pattern to last week starting tonight through next weekend. Remember last weekend when SaturDAY was dry, but then the rain moved in SaturNIGHT into Sunday? Well, expect the same deal this go around. Today was generally dry, but that is going to change as a new round of rain is moving into the area. It started raining in Hoquiam at 3 PM and will continue to move into the Kitsap area by this evening. Rain continues through tomorrow, though it won’t be relentless. Highs will be the biggest story as some forecast models are suggesting highs will be in the upper 50s and lower 60s. Because this storm system is bringing some warm, southerly air with it I almost expect highs will be quite a few degrees above the normal high of 51º. Monday through Wednesday we play generally the same tune: times of clouds, sun, and rain with highs starting out in the 50s on Monday but ending in the 40s Wednesday. The atmosphere will be rather unstable and timing each individual system will be almost impossible, so be prepared for variable skies and weather conditions over the next few days. And then there’s Thursday. This is where the Dèjá Vu thing comes into play again, because if things pan out the way predicted on the models, we could be in for a repeat of the Thursday snow. Some very chilly air is expected to seep into our area Wednesday night and with moisture around we could be in for some more lowland snow around the area. This is obviously not a slam dunk yet, but just know the potential is there. Friday onward looks drier and a bit warmer. One thing that I’ve noticed some meteorologists do is cancel winter after mid February. 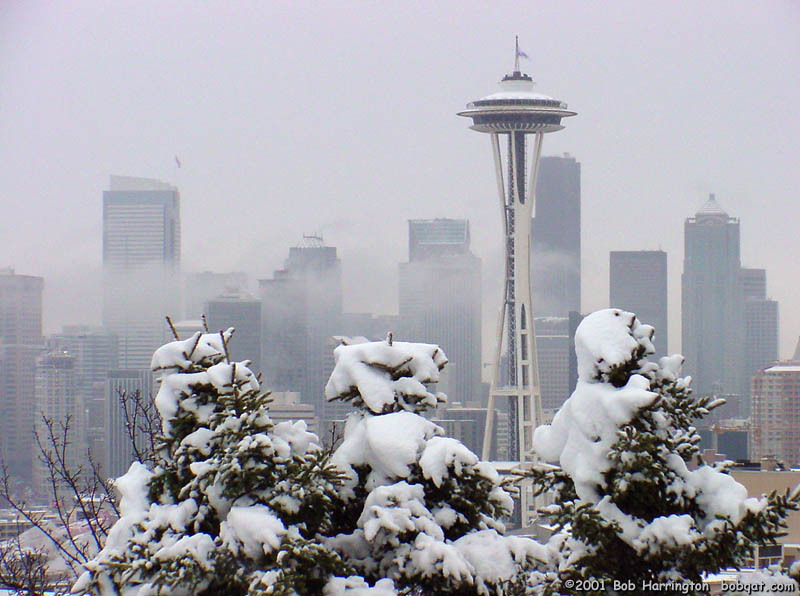 Some claim that winter weather ends in the Northwest after February 15th. But sometimes the windiest, rainiest and even coldest weather of the winter has occured in March. Long Range Thoughts and Some Cool Pics! 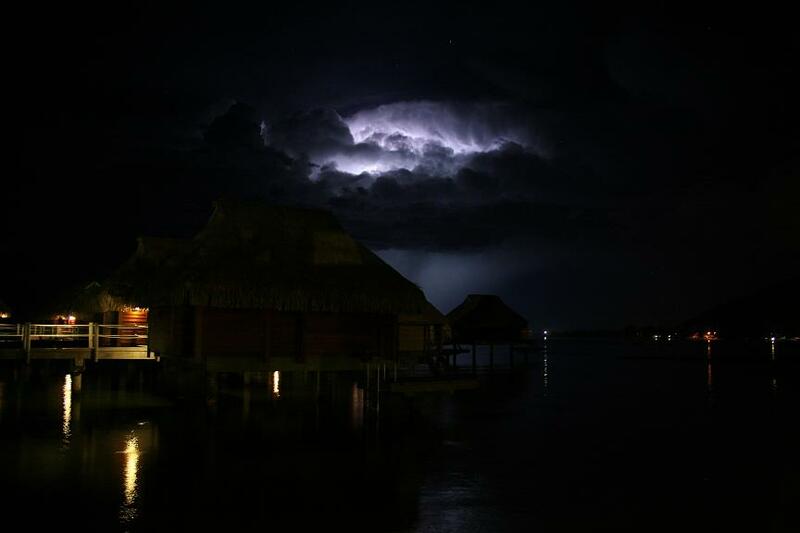 I would’ve LOVED to be there when this storm was going on! Week of March 9th-15th–Below normal temperatures and above normal precipitation over BC and the western coast of the U.S.
Week of March 16th-22nd–The West Coast of the U.S. looks colder and wetter compared to normal. Week of March 23rd-29th–Colder and wetter compared to normal over BC, the Canadian Rockies and down into the Pacific Northwest. The forecast for tonight is pretty simple: partly cloudy skies with lows approaching the freezing mark. The daylight hours tomorrow look dry and partly to mostly cloudy, but rain moves in by the evening hours and looks to continue through most of Sunday. Highs temperatures will be a bit below seasonal norms tomorrow in the upper 40s and lower 50s, but Sunday’s system looks quite warm and will likely boost high temperatures into the upper 50s or maybe even lower 60s. Perfect weather for mushrooms! Monday and Tuesday we’ll see some scattered showers and sunbreaks, but later next week we enter another period of chilly, wet weather with overnight lows becoming alarmingly close to freezing and snow levels in the 800-1,000′ range. Deja vú? Don’t bank on it quite yet, but it remains a possibility. I don’t think I mentioned this in my last post, but the National Weather Service radar is down and has been down for a couple days. They expect it to be fully repaired until this afternoon at the earliest, so weather geeks around the region are missing an important tool that will tell us when the snow is coming and where it is right now. On Silverdale Way I woke up to about 1.5” of snow, but the roads were completely clear. Temperatures have plummeted into the upper 20s and lower 30s and they’ll continue to fall until sunrise, so even though some roadways may look completely fine, it’ll still be very icy. Any more snow headed our way? Well, because we don’t have radar it’s hard to say, but the satellite imagery does suggest we do run the risk of an inch or so more of snow before this is all over, and to add to the headache it will be very random and showery in nature. By afternoon the snow risk greatly decreases as temperatures will warm above freezing and precipitation will be moving rapidly to the east. The rest of the forecast remains largely unchanged. 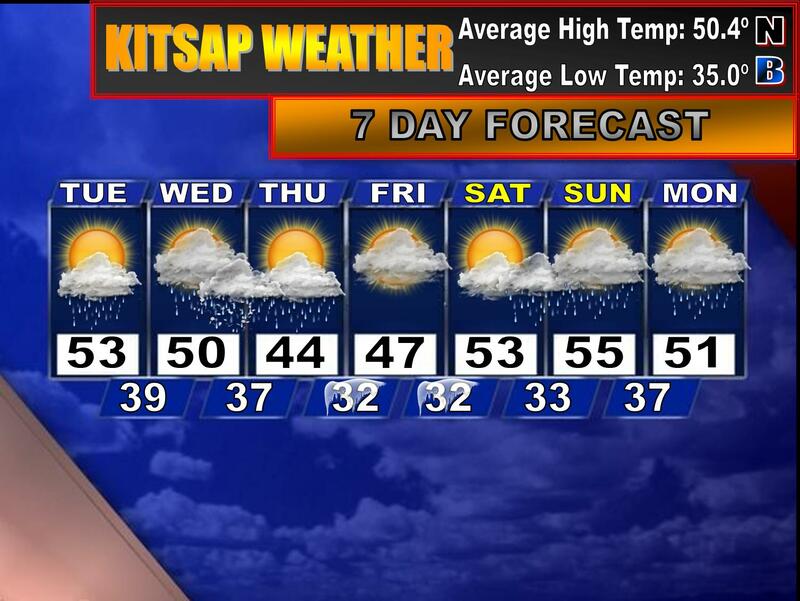 A break in the weather until Saturday night when more rain enters the area and stays here until mid week next week. So Will It Snow Or Not? The answer to that question is always complicated, and this situation is no different. 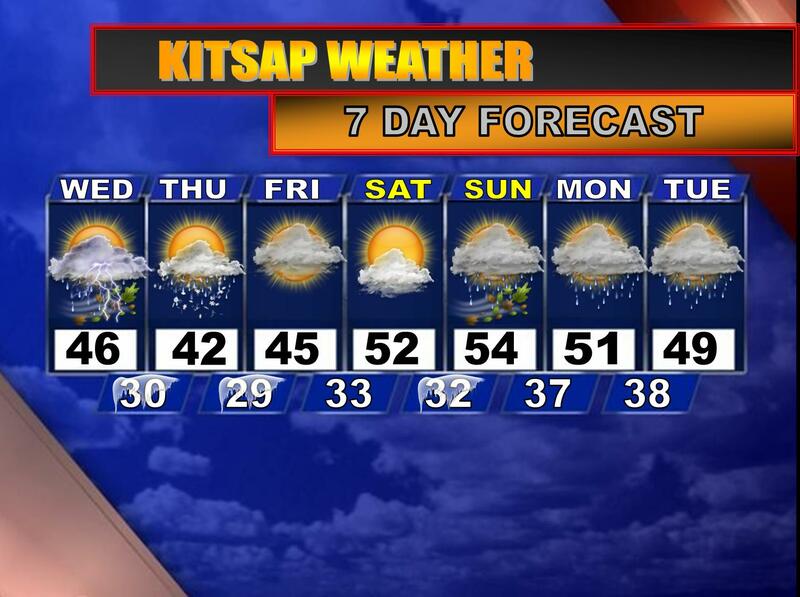 I do not expect snow for most of Kitsap. North Kitsap could be an exception, but Central Kitsap/Bainbridge will not see sticking snow…my reasoning is… [we switch] to [northwest] flow and we are still shadowed and most of the precip is to our South. Kitsap is just the worst spot for snow in this situation. This explains our situation well. Most of Kitsap will be shadowed, but a convergence zone could be generous in the late morning to drop a dusting to an inch of snow from North Kitsap as far south as Central Kitsap. One thing is certain: this is not looking like a big snow event by any means, and though tomorrow will serve as a reminder that winter is still here, it will also remind us it is loosing strength. So, overall expect an icy commute tomorrow whether we have snow or not as lows will be in the upper 20s and lower 30s. As the day progresses we’ll see sunbreaks and periods of rain with some snowflakes mixed in, and in the heavier showers we could see some plain ol’ snow with minor accumulations. Highs will be in the upper 30s to lower 40s: about 10º below normal. A cold night with scattered snow showers is in the forecast for Thursday night (no accumulation expected) and Friday looks partly sunny and dry. Highs will still be cold, however, in the low to mid 40s. Saturday starts out great, but clouds and rain increase in the evening and stick around through early next week. Mid week next week, however, we should clear up a bit, but the showers will still be around. Stay tuned for weather updates! 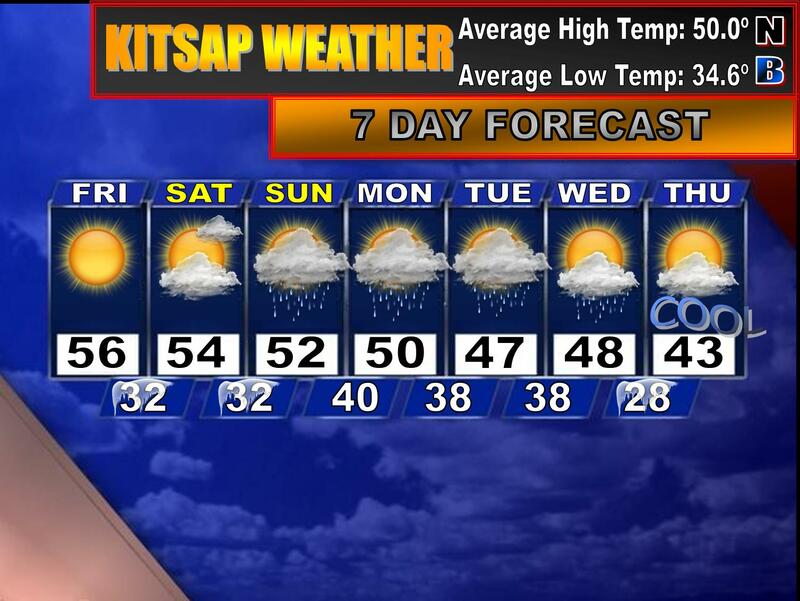 After all, we live in the Kitsap micro climate! 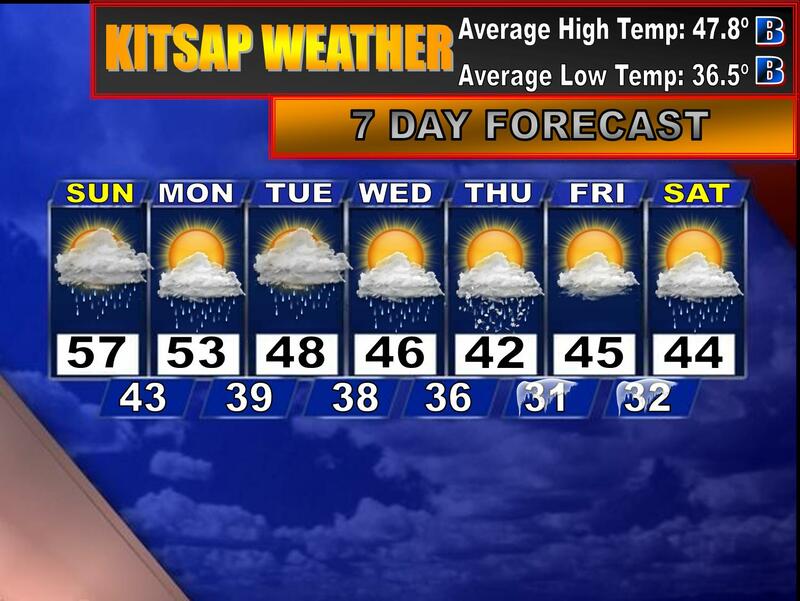 There are rumors the Hood Canal area could see some sticking snow late tonight through tomorrow. I am doing more research on this potential, but so far this doesn’t look like a major event, and not everyone on the peninsula will be affected, or at least affected the same way. INTERIOR LATE TONIGHT OR THURSDAY MORNING. In the mean time, expect continued blustery conditions, rain showers, and maybe a few claps of thunder today as the atmosphere is VERY unstable right now. And wouldn’t you know it, more windy, stormy and wet weather arrives on Sunday—the very first day of March. How appropriate! After a loooooooong vacation, we are back to Western Washington normal. So exactly how long will we be “in the norm”? For quite a while, actually, though there will certainly be a few breaks along the way—you know, for variety. The extremely heavy band of rain has passed us and passed us VERY quickly. It took less than an hour for the system to pass through the area, though it would be a mistake to think that was the last impulse as another band of rain will move through the area tonight. The rain and clouds will keep temperatures generally in the 40s. Tomorrow will start off quite rainy but as the day progresses we’ll dry out and the showers will be scattered. We’ll also be quite breezy as well, so remember…if you have a comb-over consider this a fair warning! 🙂 (Refer to last night’s post if you don’t know where that reference came from). Wednesday the clouds and rain return, but I’m keeping my eye on the aftermath of Wednesday’s rain as cold air behind the system will drop snow levels VERY low—500-1,000′ low, so don’t be surprised if you see some sloppy wet snowflakes smack your windshield Wednesday night/Thursday morning. I am not seeing any accumulations, though, so that’s a plus for some of you (watch there be accumulations just because I said there wouldn’t be. That describes my luck VERY well!). Thursday will be a cool and showery day with highs in the mid 40s, but clouds return for Friday with highs climbing back into the upper 40s and lower 50s. Saturday looks decent, but late Saturday night some more rain moves into the area and plagues our side of the state for the extended forecast period. Some more good news? The mountains will finally be back into their snow mode. While high temperatures up in the passes won’t be incredibly cold, we’ll still see some snow. P.S. I’ll try to get a video forecast uploaded on here tomorrow afternoon. I haven’t done one of those in a while! Speaking of splitting hairs, the split-flow pattern which has taken hold of our weather numerous times this winter is finally backing down and this week, as predicted, will be a more active week than the ones previous. The good news for some is the air at the surface will be chillier than it has been, but not cold enough for lowland snow. So far, the Bremerton Airport has recorded 0.08” of rain in the gauge, whereas farther south near Shelton the rain gauge reads 0.21”. 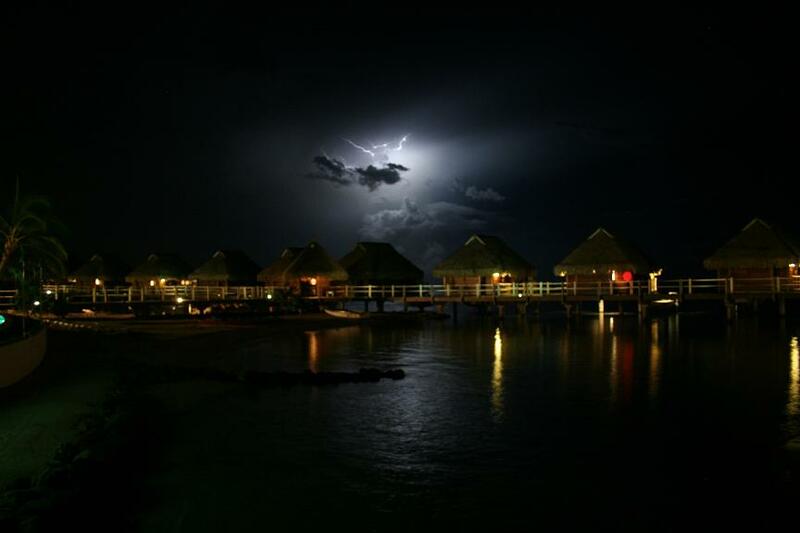 This is definitely a sign of things to come as the new week will feature more rain and clouds. Tonight will be cloudy with rain off and on. Lows will be mild in the lower 40s. Rain spreads into the area in the early morning hours tomorrow, stops by mid morning and then returns for the afternoon. Highs will be in the lower 50s. Tuesday and Wednesday will be very similar with partly sunny skies and periods of rain, mainly in the morning and evening. Highs will be in the lower 50s as well. The clouds and rain return for Thursday and Friday before the sun comes back out for the weekend. Long Range Thoughts: What Do You Get When You Mix Blue and Green? No, the answer is not turquoise, it’s mountain snow and lowland cold rain and snow. The SCWBL’s (Sunny, Calm and Boring Weather Lovers) have been so spoiled lately with this split-flow pattern, bringing us sunshine, mild temperatures, and calm weather. But models have been insisting on a change to the weather pattern for quite some time, and they have been pretty consistent about it too. I guess this means the DCRSCWL’s (Dark, Cloudy, Rainy, Snowy, Cold Weather Lovers) will soon get their turn. The above maps indicate the chances for above, near, or below normal temperatures and precipitation. The map on the left illustrates a 60% chance of below normal temperatures for our area, hence the dark blue color. The map on the right is calling for a 40-50% chance for above normal precipitation. This is good news and bad news. Good news? Mountain snow. Bad news? A potential late winter/early spring 2008 repeat where we saw cold weather and snow until the end of April. In the short term, the next threat for precipitation is on Sunday as a front moves through late Saturday night and overtakes the area Sunday morning. It doesn’t look incredibly cold, however, as highs will still be in the upper 40s/lower 50s due to the warm air mass in place when the precip arrives. A typical spring-like pattern will occur through most of next week: periods of rain, sunbreaks, and highs in the mid to upper 40s. This will definitley be a colder pattern than what we’ve experienced this past week as highs will be below normal. Some even colder air moves into the area Thursday and Friday dropping high temperatures and snow levels much lower than they should be this time of year. Temperatures: Highs in the low to mid 40s, lows in the upper 20s to lower 30s. Snow levels: 700-1,000′, mainly in the late night/early morning hours. With these ingredients, we could see a mixture of rain and snow on some of the hills around Kitsap on Friday. I won’t go too much into specifics yet, but just be aware a colder pattern is setting up for the end of next week which could spell W-E-T, S-L-O-P-P-Y, and S-N-O-W. Looking farther into la la land, some very cold and wet weather will continue to roll into the Pacific Northwest, making the Kitsap Peninsula susceptible to more of the white stuff…granted the long range models pan out as expected. It’s been a pretty impressive streak of calm weather around here. In the 43 days since flooding rains ended on January 7th, we’ve only had 14 days with measurable rainfall, and of those 14, we’ve only had two days with more than 0.10″. Typically for these 43 days, we’d expect more along the lines of 25 days with measurable rain. That’s a bonus week and a half of dry weather! Isn’t that just incredible? And while it seems like I keep saying this over and over again, the dry streak looks to end by later this weekend as our normal Washington weather returns. In the meantime, expect sunshine and highs in the low to mid 50s (maybe even upper 50s in some places!) through Saturday. Clouds increase Saturday night and by Sunday we are back into the clouds and rain. Tomorrow I’ll do an update on the long range thoughts.